Great Z's: Anesthesiologists Are Not Physicians. My EMR Says So. Anesthesiologists Are Not Physicians. My EMR Says So. The other day I happened to glance at the computer screen of the circulating nurse in the operating room. She was entering information for a case and was on the page that listed the personnel that were in the room. Typically, the EMR asks for the names of the surgeons, the nurses, the surgical tech, etc. I couldn't help but notice that anesthesiologists have their own category. Hmm. Is the computer implying that anesthesiologists are not physicians? 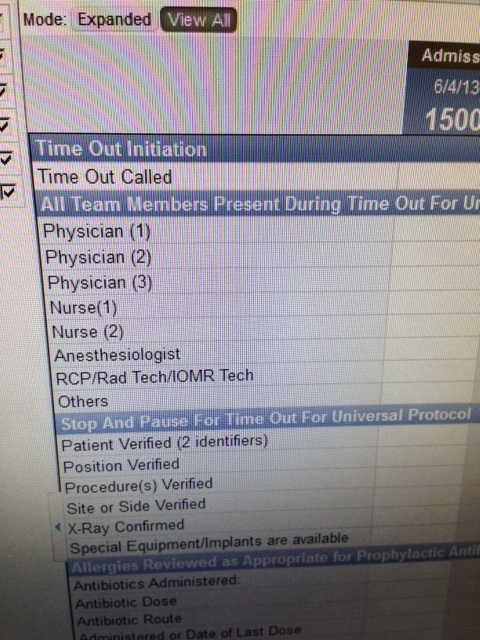 Why do anesthesiologists have a different line at all? The Physician lines make no distinction between attending surgeons, assistant surgeons, or surgical residents. Isn't that just as important to know when it comes to documenting who was working in the OR? Shouldn't there be a separate line for "Attending Surgeon", "Assistant Surgeon", and "Surgical Resident"? If our computer system doesn't really care about categorizing the physicians in the room, then why does it break out anesthesiologists as being separate from other physicians? Also, why are we placed way down at the bottom of the list? Are we not deserving of a spot higher up on the screen? Instead our names are to be entered after all the nurses and just before the technologists. I say the EMR is dissing the anesthesia profession. I need to talk to our IT guys and give them an earful about the great medical field of anesthesiology. I guess I should just be thankful they used "Anesthesiologist" instead of just "Anesthesia". That would really raise my hackles. I will point out that the order of the rows in that flowsheet and the labels on each row are completely within the control of your hospital's clinical systems team. Give 'em a call.